We have a family tradition that started when my husband was a kid, and we’ve continued it with our own children. All day on December 24th, we spend the day cooking and enjoying appetizers and desserts (instead of a planned meal). 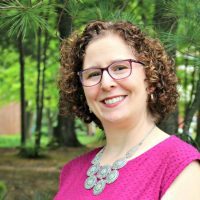 Each family member gets to pick a new recipe to try, and along with our usual favorites (my kids love pigs-in-a-blanket), we have a very relaxed day of playing board games, watching movies and eating finger foods and treats. It’s super fun! Whether you’re heading to a holiday party this week or are looking for some fun recipes for Christmas Eve like we are, these Ridiculously Easy Holiday Appetizers will hit the spot. Each recipe is made with only 3 ingredients, saving you time and stress so you can enjoy the holidays with your guests and family or bring an amazing dish to a party or potluck. 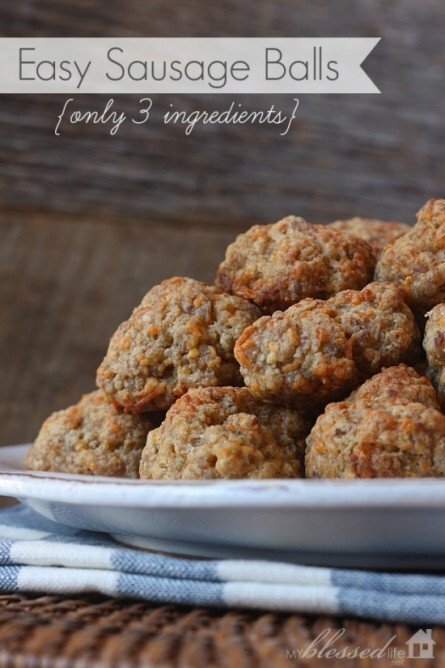 These Easy Sausage Balls from My Blessed Life are quick to prep with Bisquick, bulk sausage and shredded cheddar. These are on our to-make list this year. My kids will just love them! 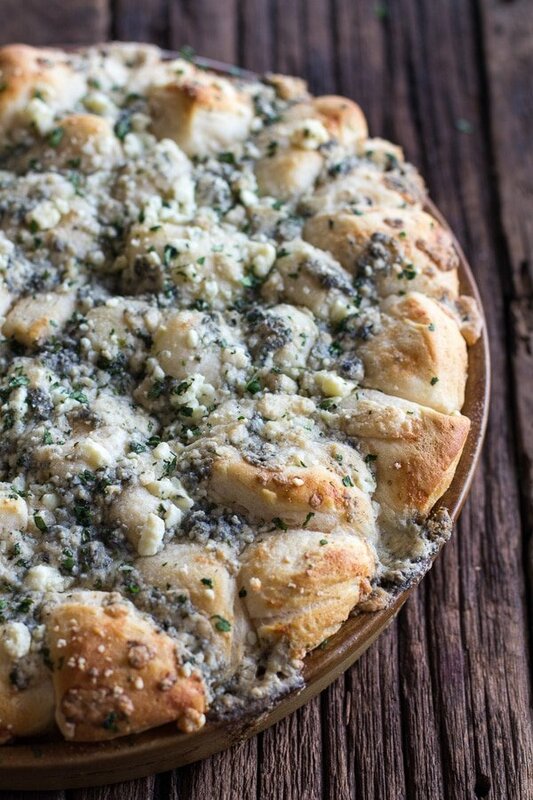 Just three ingredients–a tube of biscuits, blue cheese, and butter–makes this amazing Blue Cheese Appetizer from Half Baked Harvest. Even if you’re not a home cook, you can show up at any holiday party and amaze! Raspberry Brie Bites from The Sweets Life are an amazing combo of tangy and sweet. 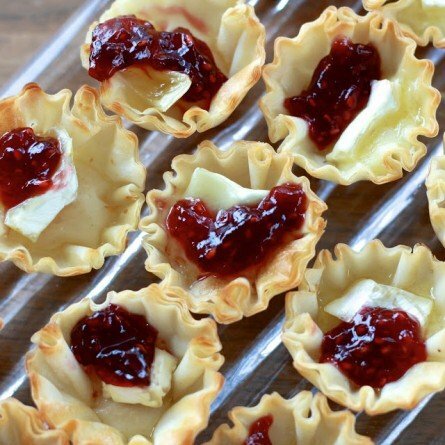 Just set out frozen fillo dough shells with bites of brie and a dollop of raspberry jam. Easy peasy, but they look so elegant. 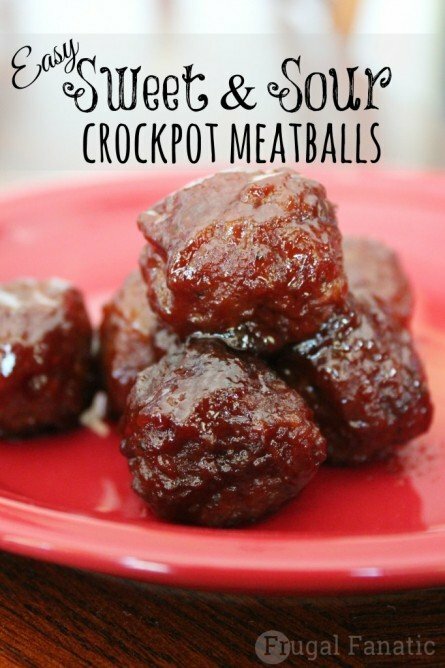 Sweet and Sour Meatballs from Frugal Fanatic cook for just a few hours in the crockpot, with just frozen meatballs, ketchup and grape jelly. A hearty, gooey dip is perfect for tortilla chips. 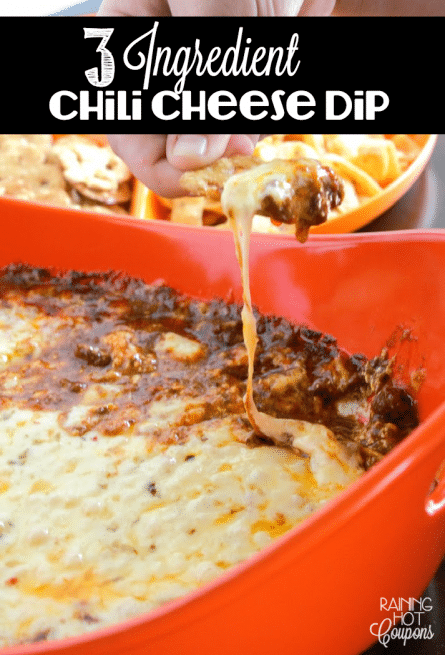 This Chili Cheese Dip from Raining Hot Coupons is just three layers of cream cheese, canned chili and shredded cheese. If you’d prefer a non-cheese dip, try the Black Bean Dip from Major Hoff Takes a Wife. 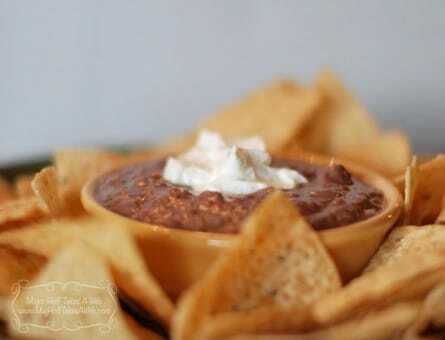 Just warm your favorite salsa combined with black refried beans and serve with a dollop of sour cream. 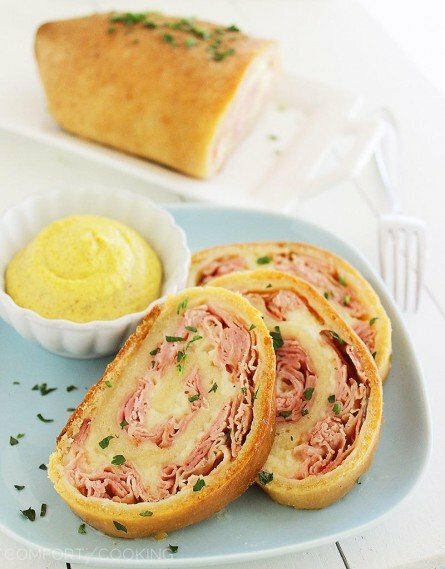 Celebrate the lack of school lunches with Baked Ham and Cheese Roll-ups from The Comfort of Cooking. Layer pre-made pizza dough with your favorite type of ham and sliced cheese, then bake. Who likes wings? 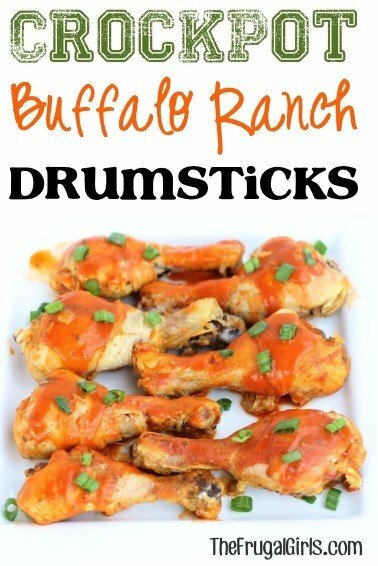 These Crockpot Buffalo Ranch Chicken Drumsticks from The Frugal Girls are even better because you get more meat! Slow cook them along with a bottle of hot sauce and a packet of ranch seasoning for a crowd-pleaser. My family loves stuffed mushrooms, but they take a lot of work. 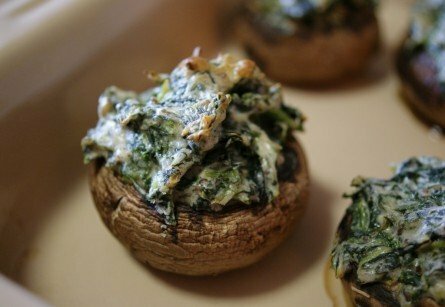 That’s why this recipe for Stuffed Mushrooms from A Nutritionist Eats is so great–just three ingredients! 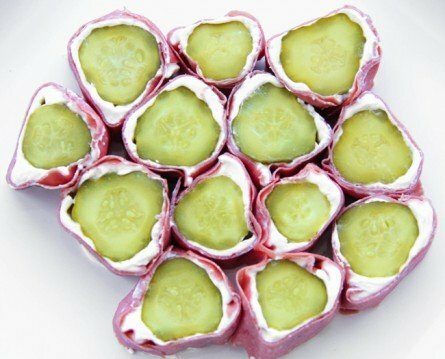 My kids love these Pickle Rollups from Pip & Ebby, though we use spicy salami instead of corned beef. The cream cheese glues them together. 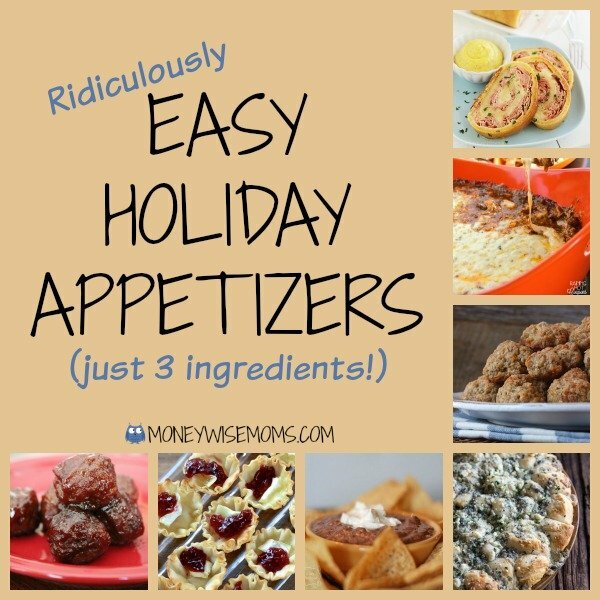 What are your favorite easy holiday appetizers? That blue cheese thing? OMG. Delicious looking and I want some!!! I know. It’s not the time to eat healthy. Thanks so much for including my easy black bean dip! I hope you love it as much as we do! Great round up! Thanks for sharing on Tasty Tuesdays!